According to the UN, the planet has warmed faster since the turn of the century than any other period on record. Sea-level rise has also increased pace to 0.12 inches a year – almost double the rate observed during the 20th century. This “unprecedented” rate of climate change is expected to disproportionally impact developing countries, whose socio-economic, political, and physical landscapes make them particularly vulnerable to the effects. 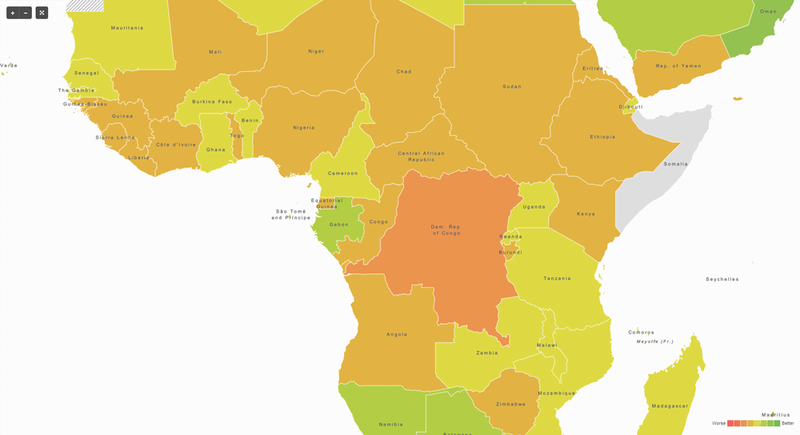 The GAIN Index, an interactive mapping tool recently acquired by the University of Notre Dame, can help policymakers prepare for these changes by comparing the climate change vulnerability and readiness of countries around the world. There are many measures of climate vulnerability, but the GAIN Index differentiates itself by not only including indicators of a country’s susceptibility to the effects of climate changes like sea-level rise, disease, and drought, but also its ability to improve readiness and adapt to them. A country’s “readiness” score is determined by estimating the ability of the private and public sectors to leverage investment resources and “apply them effectively towards increasing resiliency to climate change,” says GAIN. The index aggregates data from 14 economic, governance, and social indicators, including benchmarks of state security from the World Bank, such as rule of law and political stability indicators. Other factors included are fiscal freedom, control of corruption, and government spending as a percentage of GDP (more is bad). Similarly, vulnerability scores are calculated using 36 indicators related to a country’s water and food security, health services, urban concentration, ecosystem services, and infrastructure. For example, state dependency on natural resources, number of threatened species, and percent of land less than five meters above sea level are all taken into account. The vulnerability of human health is determined through measures such as the percentage of health expenditures derived from external sources, maternal mortality rates, and number of people living in slums. To calculate a country’s final rating, the index subtracts its vulnerability score from its readiness score, ultimately producing a rating on a scale of 0 (most vulnerable) to 100 (least vulnerable). The index draws data from a number of sources, including the Index of Economic Freedom and Worldwide Governance Indicators Project, and the methodology is fairly clear and open for others to replicate or modify. The GAIN Index shows a world where individual countries vary greatly in their susceptibility to climate change and their ability to adapt. In 2011, Denmark topped the index as the least vulnerable county. Europe as a whole is rated as the most prepared, with Switzerland, Norway, and the United Kingdom joining Denmark as four of the five least vulnerable. The United States – rated as the 20th least vulnerable country and the 12th most ready country – is well positioned to adapt to climate change, though a high disease burden (a country’s cumulative years lost to disease, disability, and early deaths) and high urban growth rates remain vulnerabilities. North Korea was rated as the most vulnerable country overall, and Africa and South Asia are the regions most at risk. Recent disasters bear these rankings out: Flooding in North Korea last June left more than 212,000 people homeless and ruined crops, while West and East Africa have both seen record-breaking droughts and famines in the last two years. The index’s dire assessment of Africa is of particular note. Among the 22 most vulnerable countries, a staggering 17 are located in sub-Saharan Africa, including Sudan, Burundi, and the Democratic Republic of the Congo. This focus on Africa echoes other analyses that cite the continent’s rapid population growth, resource-induced conflict, and dependence on rain-fed agriculture as key contributors to climate change vulnerability. GAIN’s poor assessment of South Asia is linked to predictions of increased glacial melt and flooding. According to a World Bank working paper released last month, Himalayan glacial melt and intensified monsoons are expected to raise peak flows of the region’s largest rivers – the Ganges, Indus, and Brahmaputra – creating the conditions for more of the same devastation witnessed in India last month, when flooding resulting from unprecedented monsoon rains claimed the lives of more than 5,700 people. The GAIN Index’s ability to highlight state and regional sensitivity to climate change makes it an important tool for policy analysts and researchers as they determine where international adaptation assistance is needed most. But there are some short-comings. For example, like similar indexes, GAIN relies chiefly on national-level indicators to determine state vulnerability. By foregoing the use of sub-national measurements, the index cannot account for localized variability in geography, socio-economics, or other factors within a county itself. Also, of the 50 indicators of vulnerability and readiness, only urbanization is related to population dynamics, leaving out variables such as growth rate, overall density, and migration. But, as many here on the blog have pointed out, these population dynamics can have a major impact on a country’s vulnerability or resilience to climate change. The UN recently released their revised world population projections, increasing estimates made two years ago as a result of new data from several African countries showing the average number of children per woman to be higher than previously thought. For example, Nigeria is predicted to pass the United States and become the third-most populous country by 2050. Rapidly growing populations put pressure on freshwater, forests, and land, forcing people on to more marginal land and creating more densely urbanized coastal areas that are vulnerable to sea-level rise. In a review of National Adaptation Programs of Action submitted by the governments of 41 Least Developed Countries, Population Action International showed that 37 identified rapid population growth as a factor that exacerbates climate change vulnerability. The Global Adaptation Index’s Managing Director Joyce Coffee told ECSP that adding sub-national indicators is one of the changes they are considering. “We think it would be particularly valuable for large countries that have considerable within-country variation,” like Brazil, China, and the United States, she said. The priority for now, however, is to “build upon and enhance” the national-level index before expanding to sub-national evaluations. Additional variables, including those related to population dynamics, may also be added to the revised index for 2014, she said. The index’s intuitive user interaction is a great strength, enabling the selection of specific indicators of vulnerability and readiness in order to customize country rankings, and presenting an immense collection of data in a simple, easy-to-understand, and compelling style. Perhaps most importantly, the splitting of the readiness and vulnerability scores has potential policy implications. It could help decision-makers determine where to target investments for maximum effectiveness, for example, and also underscores the disparity between the readiness of the developed world and the vulnerability of the developing world. Sources: Fifth Tokyo International Conference on African Development, Notre Dame Global Adaptation Institute, Population Action International, United Nations, World Bank.